Internal Rate of Return Templates for Excel (FES Financial Calculator) are 4 ready to use Excel templates for Net Present Value (NPV) and Internal Rate of Return (IRR/MIRR) calculation and more. 1. NPV and IRR Excel template for periodic cash flows. 2. NPV and IRR Excel Template for a schedule that is not necessarily periodic. 4. Set specific dates for each cash flow value in the internal rate of return analysis. 5. Additional Financial Excel Templates. Requires Excel 97 or later. Additional templates allow: effective annual interest rate, annual nominal interest rate, price per $100 face value of security that pays periodic interest, yield on a security that pays periodic interest, number of periods for an investment based on an interest rate and a constant payment schedule, future value of an investment based on an interest rate and a constant payment schedule, present value of an investment based on an interest rate and a constant payment schedule, payment amount for a loan based on an interest rate and a constant payment schedule. 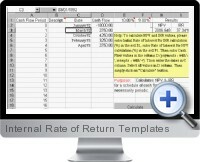 Internal Rate of Return templates for Excel have easy function navigation in 4 workbooks. Use of some complex financial functions are simplified by VBA procedures.